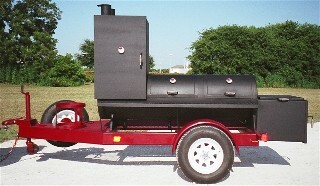 Why are our BBQ Pits Priced so low??? 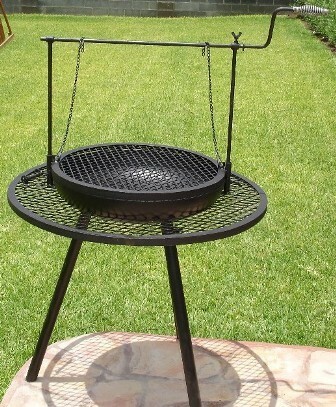 New BBQ Grill.....Introductory Low Price!!! 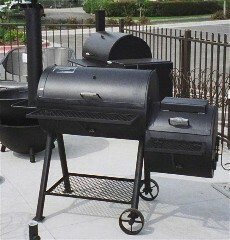 We have two styles of back yard BBQ smokers, the All American BBQ Smokers and the Old Country BBQ Pits. They both produce great tasting barbeque with less effort than ordinary BBQ Smokers. Our BBQ Smokers are designed to reduce hot and cold spots within the cooking chamber, to retain the heat, prevent smoke from leaking, have a long life and, basically, aid you to barbeque. BBQ Pits. They have an excellent heat retention capacity. 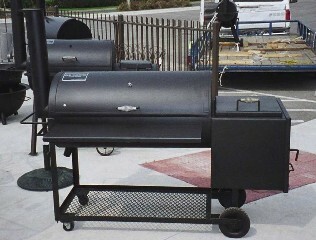 They have a big firebox baffle and the smoke stack is placed in the center of the grill section this helps to reduce the cold and hot spots in the grill section. The fire box has a fire grate designed to promote air flow and sliding cooking grate. 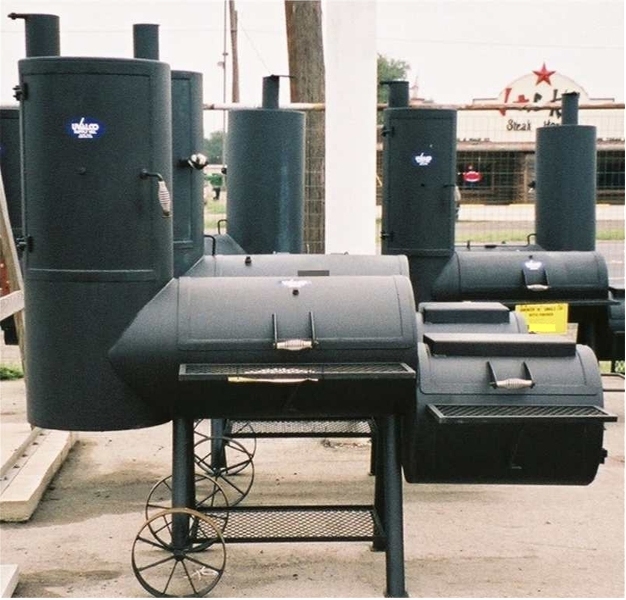 Old Country BBQ Smokers These are the old style BBQ smokers they are built with 1/4" thick steel plate and are completely welded. Even though this is the classic style it has some new features like the expanded metal grates which are framed with angle iron and slide in and out of the BBQ smoker. They also have stainless steel "stay cool" spring handles, adjustable air intake, and a folding table. The vertical chamber has 3 grates, 2 rod hangers and a temperature gauge port, it is also flat in the bottom for the people who like to place a water bowl. The fire box has a fire grate designed to promote air flow and sliding cooking grate. They also have an excellent at heat retention and will help you BBQ. The Old Country BBQ Pits. 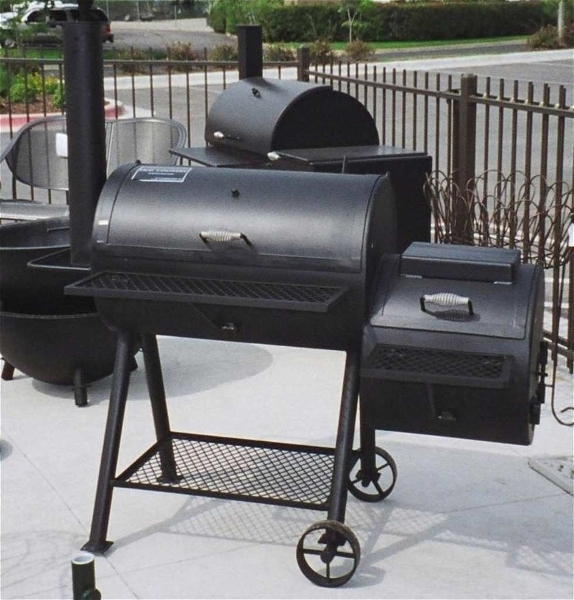 These classic style bbq pits are built with 1/4" thick steel plate. They have an all welded construction. They have an excellent heat retention capacity. 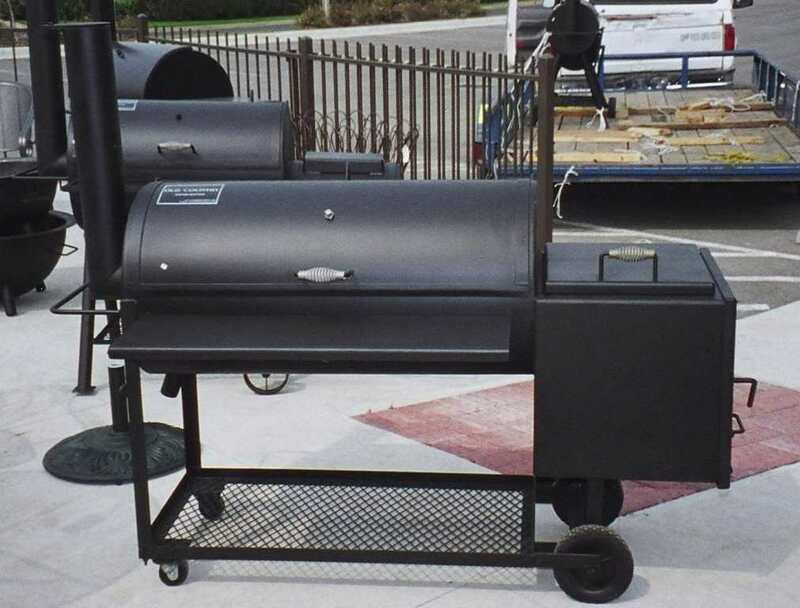 They have a big firebox baffle and the smoke stack is placed in the center of the grill section this helps to reduce the cold and hot spots in the grill section. 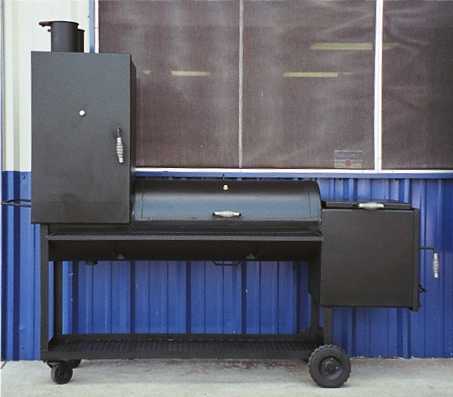 They come with framed slide out grills, stainless steel spring handles, folding table, adjustable air intake and adjustable smoke stack. The fire box has a fire grate designed to promote air flow and sliding cooking grate. Old Country 20"x60": Price $1,350.00-- Free shipping and crating. Firebox: 20" long, Cooking chamber 40" long, with upper grate. Old Country 20"x48": Price $1,195.00-- Free shipping and crating. Firebox: 18" long, Cooking chamber 30" long, with upper grate. Old Country 16"x 48": Price $1,100.00-- Free shipping and crating. 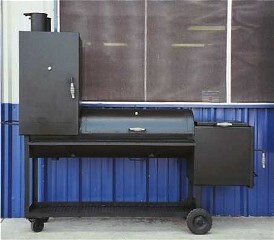 Questions regarding the BBQ Smokers? Contact us! !